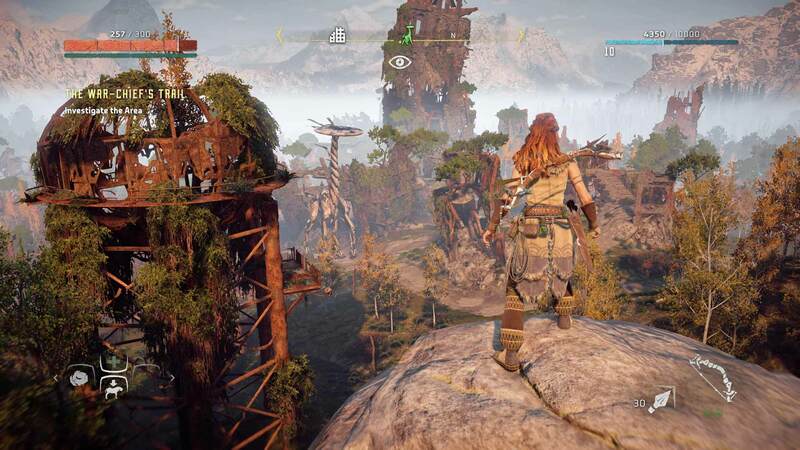 Horizon Zero Dawn, an open-world RPG action game, developed by Guerrilla Games and published by Sony Computer Entertainment, released February 28th, 2017 for the PS4. I’m just going to say right now that this was a beautiful game, truly remarkable. I would get goosebumps just looking around the area and enjoying the view. 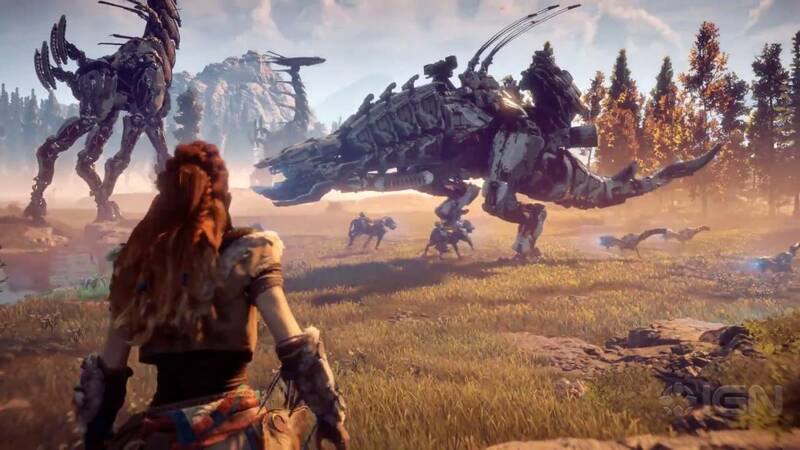 Horizon Zero Dawn is set in a post, post-apocalyptic world and mankind is in its tribal stage while Machines with AI that look like Dinosaurs are roaming the world. 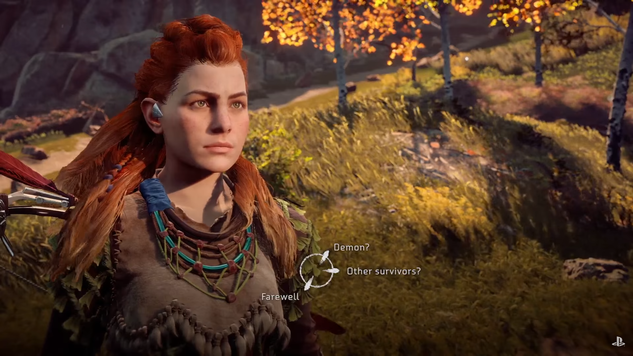 You play as our main protagonist, Aloy, a huntress, looking for information on her mother while uncovering the secrets of the Old Ones. In the beginning, you start out as a young Aloy, a motherless outcast, learning from her adoptive father, Rost, how to hunt and survive in the wild. Aloy wanted to fit in with the rest of the children but was denied even the communication from other mothers and children. Aloy ran away and suddenly fell into a hole that leads into old ruins that look like a futuristic bunker but set in stone and metal. 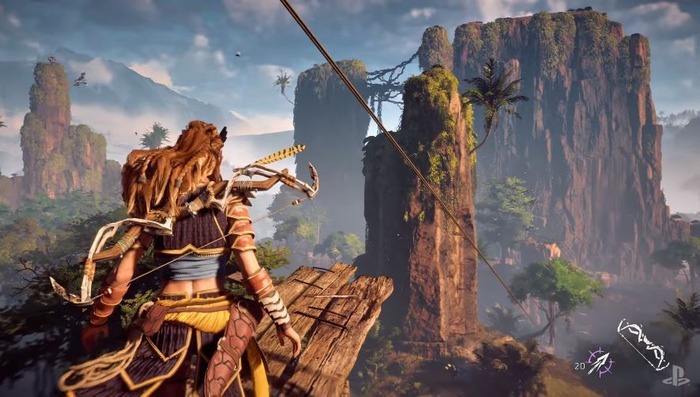 Aloy then finds a device called a Focus that she puts on her ear and she is able to see more of the world around her and using this technology will help Aloy in the long run. Gameplay wise, you can talk to people and ask questions, sneak around enemies, assess the area with your Focus, set traps, and use your bow with many different arrows. You can also slow down time to get a more precise kill and the larger the Machines, the longer it takes to destroy them and trust me, there are some HUGE Machines out there. There are side quests, errands, bandit camps to overrun, hunting grounds to test your skills which in turn can help level you up before you go on the main quest and you would have to grind a little bit if you want to level up certain skills. You can also search the corpses of Machines and humans for resources to make traps, potions, and arrows and to upgrade your armor. With the Focus, you can search for herbs and items around the world that you can also use for traps, potions, arrows, armor, and as well. It took me about 3 weeks to finish the main quest and I’m only 82% progression because there are tons of Hunting Grounds and Bandit Camps to do and even items to find such as Datapoints, Metal Flowers, and Ancient Vessels. Overall, I’m in love with this game, it was amazing. The only thing that bothered me were the clipping textures throughout the game but what video game doesn’t have that? Have you guys played Horizon Zero Dawn? ← Dragon Ball Xenoverse 2 Coming to the Nintendo Switch this fall!